Lately there has been an idea circling around that cats can bring luck. 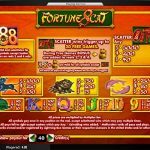 So Lightning Box used that for their latest video slot game Fortune 8 Cat. The game has an oriental theme and the reels are set in what seems to be a Chinese house. So, let’s see whether this lucky cat can bring some fortunes our way. Fortune 8 Cat features couple of symbols that can make some changes to your balance and one special feature. The wild symbol is the 888 icon and its function is to substitute for every other symbol except the scatter to complete a winning line. The Chinese crackers symbol is the scatter and it is the key to the main feature, the free spins round. All you have to do is to land 3, 4 or 5 scatters to receive up to 20 free spins. There are more wilds in the free spins round and that is the thing that makes this feature so special. The Maneki Neko will appear before the feature starts and a random number of free spins will be added to the second, third, fourth and fifth reel. 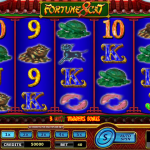 Fortune 8 Cat is slightly run of the mill slot but it is still worth the try. Lightning Box has done an amazing job when they created this game and they had only one idea in mind, to create a simple yet entertaining game. We know that black cats do not bring any luck, but Fortune 8 Cat does. So that is why you have to give this game a chance. The betting options are also on your side too. They are created in that way they can suit every kind of a roller’s need. 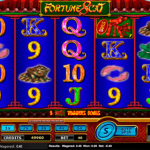 For another great engaging game you should consider playing Fire Hawk a 5 reel slot by NextGen.